I have been down this road before, but like any good traveler, I am willing to go there again with hopes of seeing something I may have missed before. I have oodles of old Sturbridge stuff busting out of boxes here at this old house that needs to be in the hands of those that are willing to archive it for the future. I have had the previous two town administrators stop by the house to check out the maps, and documents with the intention of taking them off my hands for the benefit of preserving town history. Don't know why, but maybe it has something to do with the town not having a place to display the empherma. In the meantime, I rescued it from the landfill, the internet, and a lot was given to me with the purpose of preserving it. No sense in preserving something if it can't be seen by the public. I've had much of the collection for fifteen years. I'm still waiting on the town to step up, but I can't wait for ever. Currently, I am packing up a lot of accumulated stuff, and I came across the town reports, and assessors reports for the Town of Sturbridge from 1902 through 1912 pictured below. They need to find a home. 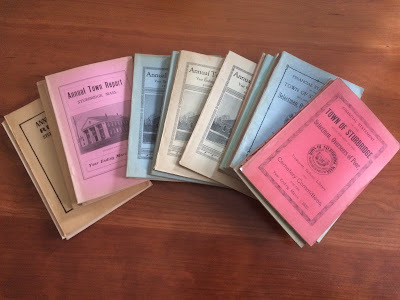 If you are a school, or a library, a historian, or a student just interested in local old stuff, please contact me, and I will be happy to put these in you hands. I have some doubles, and like baseball cards, that means there are a lot to go around. As far as the other historic documents go, well, I don't know. I contacted the curator at Old Sturbridge Village years ago, but there was little interest. The town is not interested, and the Historic Commision has passed as well. After fifteen years of keeping the documents safe, and no interest to take over the duty, it may be time to use Ebay to get them into the hands of collectors. Can't say they never came home again. They just weren't wanted. As part of the Town Hall/Center Office Building renovation project, a display cabinet was built on the second floor of the COB for this type of material.